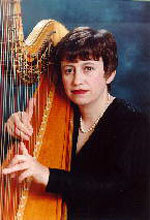 Born in Wales, Sioned Williams is one of the most outstanding harpists of her generation. After her initial success in competitions and in gaining awards and scholarships she became known on the concert platform worldwide, regularly appearing in prestigious venues including Carnegie Hall, the Purcell Room and Wigmore Hall. Sioned combines her work as Principal Harpist of the BBC Symphony Orchestra with solo appearances, recordings and teaching. She has taken part in all the major British festivals, as well as many festivals in Europe, America, Japan and elsewhere. Her schedule in recent years has included a concerto appearance with William Bennett and the ECO at the Barbican, the first modern-day performance of Adagio by John Thomas with the BBC Welsh SO, and recitals with such artists as Neil Mackie, Malcolm Messiter, Michael Chance and Martyn Hill. Sioned has accompanied the choir of Christ Church, Oxford, performed with Aurèle Nicolet in the Cheltenham Fesival, and appeared with the BBC Singers in the Janácek Festival at the Barbican. She has appeared in the Royal Festival Hall with the BBC Symphony Chorus in Brahms's songs for choir, harp and horns and performed and broadcast Glière's Romantic Concerto. She has performed with The Sixteen at St John's Smith Square, and in September 1997 gave the first performance of a work for solo harp by Pizzetti on Radio 3. Sioned's impressive list of commercial recordings includes Britten's Canticle No 5 with Anthony Rolfe Johnson, Britten's A Ceremony of Carols with the choristers of Westminster Cathedral, and works by Holst with the Holst Singers—all on Hyperion. Sioned broadcasts extensively on television, Radios 2, 3 and 4, and has had her own series 'Affairs of the Harp' on Radio 4 and the World Service.